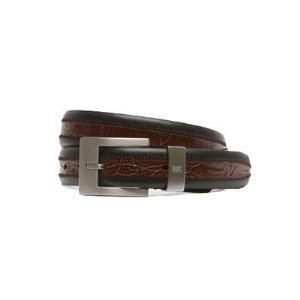 The Nike Golf Tiger Woods Men's Croco Overlay Leather Belt is a two-tone black and brown. (Yuck!) The brown interior is a hand-stitched Italian lux croco overlay. (This is a fancy way of saying some "Jackamo" spent a long time trying to make this belt look like it was made of crocodile.) The square buckle (which I believe was all the rage in the '80s) is a brushed finish with a laser Tiger Woods logo on the matching loop. The belt comes with Nike's G-Flex stretch insert, so I'll need to pull that much harder to strangle myself with it, rather than wear it! If you want to buy a stylish Tiger Woods belt with the croco style and the Nike G-Flex, check out the Nike Golf Tiger Woods Men's Croco Leather Belt with Laser Etched Hardware. It's a good-looking brown belt that will complement your fashionable golf wardrobe.